You’re on graduation quotes, page 3 of 8 Graduation wishes, messages and quotes. See other related pages menu at bottom of page. 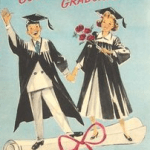 Our graduation quotes collection is for when you’re looking for that perfect quotation for the graduate. Incorporate a well written quote into your congratulations card or message. That’s how change happens. One gesture. One person. One moment at a time. Do not dwell in the past, don’t dream of the future, concentrate the mind on the present moment. Life moves pretty fast if you don’t stop and look around once in a while you could miss it. May your hand always be busy, may your feet always be swift, May your heart always be sung and may you stay forever young. Why wait any longer for the world to begin. Glass, china and reputation are easily cracked, and never well mended. I hope your dreams take you to the corners of your smiles, to the highest of your hopes, to the windows of your opportunities, and to the most special places your heart has ever known. Ralph Waldo Emerson once asked what we would do if the stars only came out once every thousand years. No one would sleep that night, of course, We would be ecstatic, delirious, made rapturous by the glory of God. Instead the stars come out every night, and we watch television. Life is not about warming yourself by the fire, life is about building the fire. And generosity is the match – If you want happiness for an hour, take a nap, but if you want happiness for a lifetime, help somebody. Do not pray for easier lives, pray to be stronger men. I’m an idealist: I don’t know where I’m going, but I’m on my way. Today you are you, that is truer than true. There is no one alive that is youer than you. When you leave here, don’t forget why you came. If at first you don’t succeed, do it like your mother told you. The stars are beautiful because of a flower that cannot be seen. The light that shines on you shows where you are, the light that shines in you shows where you will go. The key to happiness is having dreams; the key to success is making them come true. Best to take the moment present as a present at the moment. We laughed until we had to cry, we loved right down to our last goodbye, but over the years we’ll smile and recall, for just one moment…we had it all! The bravest thing you can do is be yourself. There will come a time when you believe everything is finished…that will be the beginning. Long ago, in a time that has faded from memory, a mother’s tears forged the bridge that, ever after, connected the power of the living every changing world to the human heart. The choices you don’t make are as important as the ones we do make. Use what talents you possess: the wood would be very silent if no birds sang there except those that sang best. It’s just life so keep dancing through. All our dreams can come true…if we have the courage to pursue them. To those of you who received honors, awards and distinctions, I say well done. And to the C students, I say you too may one day be president of the United States. Just don’t give up trying to do what you really want to do. NOTE: Sometimes the best graduation quotes are short and to the point. Other graduation quotes take some time to get there, but the wait is worthwhile. Try incorporating some graduation quotes into your message to your favorite graduate. Find the right quote, and add the right message, and your congratulations greeting will stand out. If your uniform isn’t dirty, you haven’t been in the game. It is clear the future holds great opportunities. It also holds pitfalls. The trick will be to avoid the pitfalls, seize the opportunities, and get back home by six o’clock. The man who graduates today and stops learning tomorrow is uneducated the day after. The most rewarding things in life are often the ones that look like they cannot be done. The tassel’s worth the hassle! The things taught in schools and colleges are not an education, but the means of education. JK Rowling – See more insights from J.K. Rowling. What lies behind us, and what lies before us are small matters compared to what lies within us. You may not always have a comfortable life and you will not always be able to solve all of the world’s problems at once, but don’t ever underestimate the importance you can have because history has shown us that courage can be contagious, and hope can take on a life of its own. Your time is limited, so don’t waste it living someone else’s life. Don’t let the noise of others’ opinions drown out your own inner voice. And most important, have the courage to follow your heart and intuition. Take action. Every story you’ve ever connected with, every leader you’ve ever admired, every puny little thing that you’ve ever accomplished is the result of taking action. You have a choice. You can either be a passive victim of circumstance or you can be the active hero of your own life. In life you make the small decisions with your head and the big decisions with your heart. The first thing I would like to say is “thank you.” Not only has Harvard given me an extraordinary honor, but the weeks of fear and nausea I have endured at the thought of giving this commencement address have made me lose weight. A win-win situation! Now all I have to do is take deep breaths, squint at the red banners and convince myself that I am at the world’s largest Gryffindor reunion. So they hoped that I would take a vocational degree; I wanted to study English Literature. A compromise was reached that in retrospect satisfied nobody, and I went up to study Modern Languages. Hardly had my parents’ car rounded the corner at the end of the road than I ditched German and scuttled off down the Classics corridor. However, the fact that you are graduating from Harvard suggests that you are not very well-acquainted with failure. You might be driven by a fear of failure quite as much as a desire for success. Indeed, your conception of failure might not be too far from the average person’s idea of success, so high have you already flown. So given a Time Turner, I would tell my 21-year-old self that personal happiness lies in knowing that life is not a check-list of acquisition or achievement. Your qualifications, your CV, are not your life, though you will meet many people of my age and older who confuse the two. Life is difficult, and complicated, and beyond anyone’s total control, and the humility to know that will enable you to survive its vicissitudes. One of the greatest formative experiences of my life preceded Harry Potter, though it informed much of what I subsequently wrote in those books. This revelation came in the form of one of my earliest day jobs. Though I was sloping off to write stories during my lunch hours, I paid the rent in my early 20s by working at the African research department at Amnesty International’s headquarters in London. There in my little office I read hastily scribbled letters smuggled out of totalitarian regimes by men and women who were risking imprisonment to inform the outside world of what was happening to them. I saw photographs of those who had disappeared without trace, sent to Amnesty by their desperate families and friends. I read the testimony of torture victims and saw pictures of their injuries – I opened handwritten, eye-witness accounts of summary trials and executions, of kidnappings and rapes. And as long as I live I shall remember walking along an empty corridor and suddenly hearing, from behind a closed door, a scream of pain and horror such as I have never heard since. The door opened, and the researcher poked out her head and told me to run and make a hot drink for the young man sitting with her. She had just had to give him the news that in retaliation for his own outspokenness against his country’s regime, his mother had been seized and executed. And many prefer not to exercise their imaginations at all. They choose to remain comfortably within the bounds of their own experience, never troubling to wonder how it would feel to have been born other than they are – They can refuse to hear screams or to peer inside cages; they can close their minds and hearts to any suffering that does not touch them personally; and they can refuse to know. If you choose to use your status and influence to raise your voice on behalf of those who have no voice; if you choose to identify not only with the powerful, but with the powerless; (and) if you retain the ability to imagine yourself into the lives of those who do not have your advantages, then it will not only be your proud families who celebrate your existence, but thousands and millions of people whose reality you have helped change. We do not need magic to change the world, we carry all the power we need inside ourselves already: we have the power to imagine better. I am nearly finished. I have one last hope for you, which is something that I already had at 21. The friends with whom I sat on graduation day have been my friends for life. They are my children’s godparents, the people to whom I’ve been able to turn in times of trouble, people who have been kind enough not to sue me when I took their names for Death Eaters. At our graduation we were bound by enormous affection, by our shared experience of a time that could never come again, and, of course, by the knowledge that we held certain photographic evidence that would be exceptionally valuable if any of us ran for Prime Minister. We’re always on the lookout for some great graduation quotes. 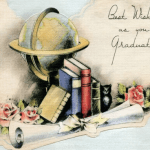 If you have graduation quotes for son, graduation quotes for daughter, graduation quotes for friends, graduation quotes for brother, graduation quotes for sister or just some of your favorite graduation quotes, please submit them through the contact us page.